Please complete this form to request a quote. Expected turn-around time for detailed custom cakes or very large orders is 4-6 weeks depending on our schedule and observed holidays. Sometimes we have a quicker turn-around time, it's always good to ask! Before we can provide you with an accurate quote, we will need to know the design you are looking for and how many servings you require. 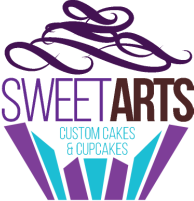 If you wish to send us photos of a cake design, you may email us directly at luvsweetarts@hotmail.com. We will respond to your request within two business days; if you do not get a response after that time, please call us to ensure we received your request! For a quicker response, please call us at 209-879-3353 or come in. Our order specialists are available Tuesday - Friday between 9:00 am and 3:00 pm. Use this section to list the details for what you are interested in. Please include type of occasion, date of event, # of servings.